Our unique Rimu Room may be perfect for your next private dining event or function. Situated in the heart of Auckland’s CBD and seating up to twenty, this relaxed yet elegant area offers an exclusive and intimate dining experience. Situated in the fifty-seat formal dining area of The Cut Restaurant & Bar, The Rimu Room is ideal for work meetings or lunch & dinner functions. Let our talented team in the kitchen create your own special menu or choose from our tantalising set of menu options. 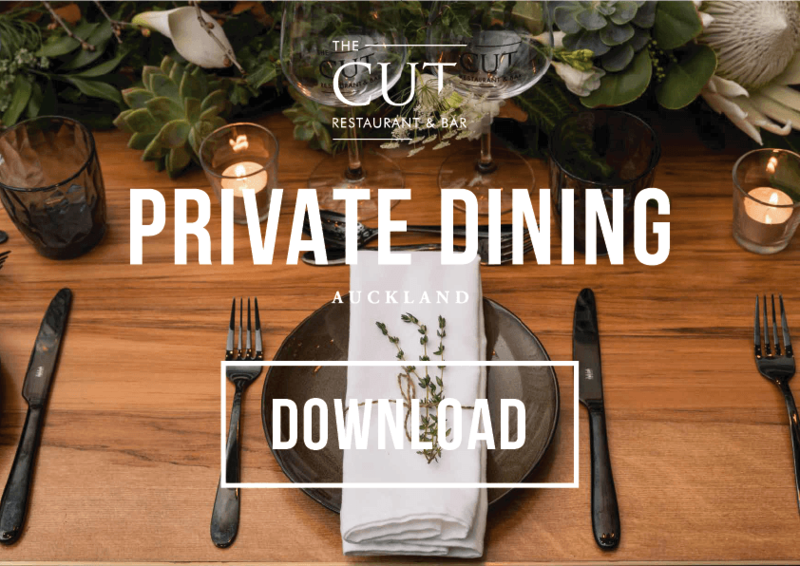 Widely regarded as one of Auckland’s best private dining venues The CUT Restaurant is hidden away from the hustle and bustle of the city but just moments walk from the vibrant Viaduct and Britomart. We can offer both valet and self-parking options for our guests. We’re also really easy to get to from wider Auckland locations via public transport services. Do you require a projector, screen or microphone? An extensive range of audio visual equipment is available for the Rimu Room on request. View our Rimu Room floor plan here. Need more space?? Give us a call and we’ll do our best to meet your requirements.